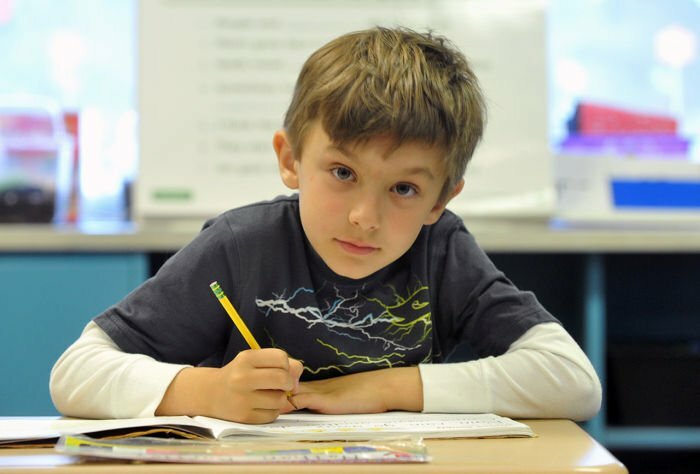 Brian Ruga, 9, likes to write in cursive. 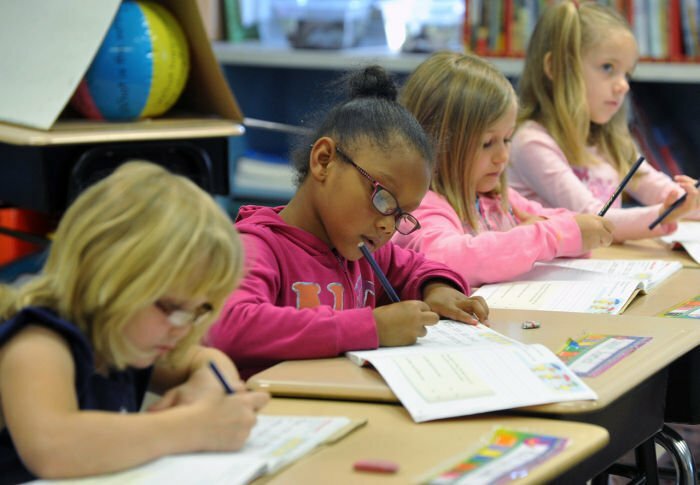 New Jersey Department of Education language arts standards used to require that students be able to write legibly in manuscript or cursive by the end of third grade. But the state has since adopted the national Common Core Standards, which do not include cursive at all and put more direct emphasis on technology. Now third grade students are expected to use keyboarding skills to produce and publish writing. The change has led to a national discussion of how much time to spend teaching cursive or whether to teach it at all. Some state Boards of Education have added cursive writing to the Common Core requirements, including Alabama, California, Georgia and Massachusetts, according to a report by the National Association of State Boards of Education. New Jersey has not added cursive, state Department of Education spokesman Richard Vespucci confirmed. But local school boards still can require it be taught, he said. A June 2012 survey by the New Jersey School Boards Association of its members found 57 percent that responded said they were still teaching cursive, while 16 percent said they were not. The rest did not know or said it was not applicable to their district. In September 2012, the national association put out a policy paper on the handwriting debate, noting that viewpoints vary. Some people believe handwriting, and cursive in particular, is becoming out-dated and there are more important things to teach. Others say handwriting reinforces cognitive and motor skills, and is linked to reading comprehension, brain development and memory. Weymouth third-grade teacher Erin Porter said she still believes all students should learn cursive, and she typically teaches it for one 40-minute period per week. She walked around the classroom and carefully inspected each student’s writing during a recent class. “Don’t be surprised if I ask you to erase,” she said as she reviewed their workbook pages. While Ruga prefers cursive, classmate Brooke Gayle does not, saying there are too many loops in her name. “I like it better in print,” she said. Cori Meredith, an assistant professor of teacher education at the College of Education at Rowan University in Glassboro, said she sees keyboarding starting to replace cursive. She said many teachers she works with already prefer typed papers because student handwriting is so poor, for lack of practice. Porter and other teachers in Weymouth Township have strong support from Superintendent Donna Van Horn, who has stressed handwriting still is valuable. Van Horn said the emphasis on using technology to research primary source documents means students will have to understand cursive to read the Constitution and other documents or letters. “How are they going to read these things if they don’t know cursive?” she asked. Students in the small, rural school have another reason to like handwriting. Four students recently won state and national awards in the annual handwriting contest sponsored by Zaner-Bloser, a publisher of handwriting instructional tools. More than 350,000 students participated nationwide. First-grader Nathan Bartley is both the state and national grand champion in his age group. Fourth-grader Hannah Appleget, seventh-grader Erin Levari and eighth-grader Cortni Bartley each won state championships in their grade. Van Horn said she has entered the contest for years in every district where she has worked, and having a national winner this year has definitely spurred student enthusiasm for having good handwriting. Nathan’s teacher, Amanda Gianfortune, makes writing fun. Students act out punctuation marks by jumping up in excitement for an exclamation point, curling over to pause for a comma, and putting their arm out in a stop motion for a period. They are currently printing a poem for Mother’s Day and Nathan demonstrated his ability to write very neat letters, spaced evenly apart. Good handwriting may be hereditary in the Bartley family, but Gianfortune believes all students can improve with practice. Nathan’s big win has also been a schoolwide incentive to have good handwriting.